So, I know it’s been forever ago since I’ve last written a post. Life is SO busy, I don’t know how mommy’s do it! A month ago, me and my sister-in-law’s, sister-in-law (did ya get that one?!) hosted a “Meet-The-Baby” party for Christie’s baby girl Charis. It was so much fun coming up with different foods and decorating ideas for this little shin-dig. One of the desserts I found from Pinterest (where else do you go to find party food ideas?!) turned out to be absolutely AMAZING. 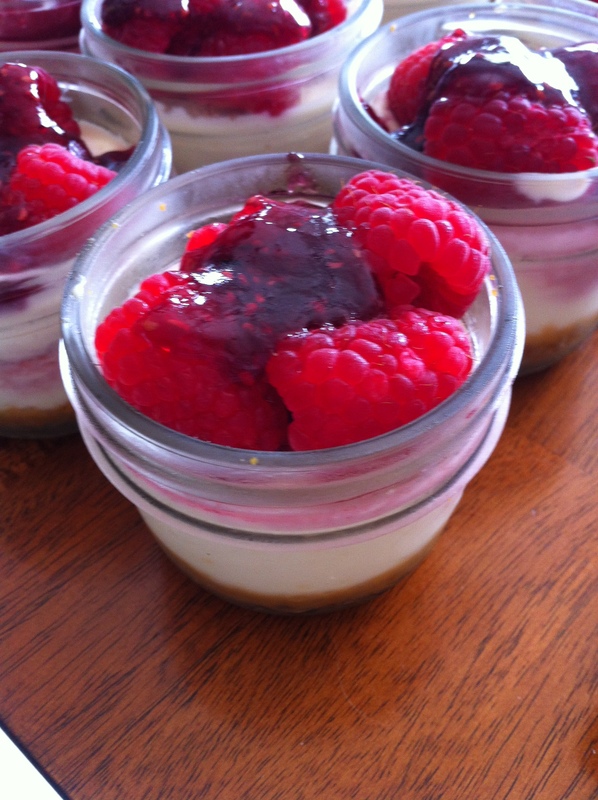 Mini Raspberry Cheesecakes. In jam jars. Can you say cute or what?! It didn’t take as long as I thought it would and I will be sure to use this idea again at future events! Spray the jelly jars with non-stick cooking spray or cover in oil so the crust doesn’t stick. In a large mixer bowl, mix the room temperature cream cheese with the 3/4 cup of sugar until smooth. Add the eggs, one at a time, and mix well. Add the sour cream, vanilla and lemon juice and mixed well. Fill each jelly jar with about 1/3 cup of the filling, leaving room at the top for your topping. Place the jars in a large roasting pan or deep baking dishes (I used 3 pieces of corningware). Fill the pan with hot water halfway up the jelly jars. Place in the oven and bake for 30 minutes. Remove jars with tongs and place on a wire rack to cool. For the raspberry topping: pick over the raspberries and discard any that are moldy or bruised. Place a few raspberries on top of each cheesecake. Heat about 1/3 cup of the jelly in a microwave and stir so that the jelly is spreadable. Brush the tops of the raspberries gently with the jelly to glaze them. Refrigerate cheesecakes until ready to serve. This can be made the day before! looks yummy! very cute indeed!